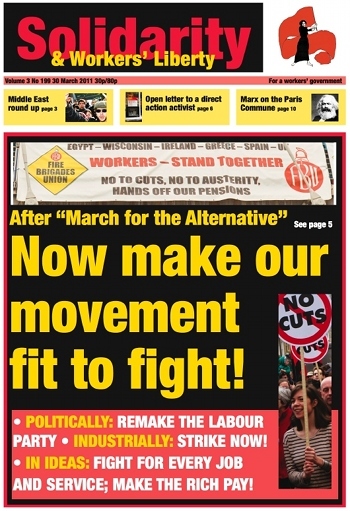 Build a Working-Class Political Alternative to the Coalition! Israeli left: "We are not loyal to a government of racists"
As we go to press, the key towns of Brega and Ajdabiya have now been taken by the rebels and Qaddafi forces are everywhere in retreat. Libyan rebel troops are surrounding Sirte, birthplace and symbolic heartland of the Qaddafi regime. Their siege positions in Misurata are also less under-threat than last week. The change of fortunes for the rebels is largely as a consequence of the international air strikes. And that action now seems to be directed at “regime change”. Germany, Italy and Turkey continue to argue for a softer option. The uprising which began in the southern Syrian town of Deraa on 18 March continues to shake the nasty, brutal regime of Bashar Assad. Protesters have been demanding more political freedom and have targeted businesses run by Assad’s relations. On Monday demonstrators converged on a main square in Deraa chanting: “We want dignity and freedom!" and "No to Emergency Laws!” The protesters also want the release of thousands of political prisoners. On Saturday, demonstrators set fire to the ruling Baath party’s local headquarters in Tafas. Last week’s Budget was further proof that the Tory government and its Lib-Dem hand-raisers are waging a vicious class war against the working class on behalf of their wealthy friends and backers. Dubbed a “Budget for Growth”, its lustre was diminished instantly when Osborne downgraded his own 2011 growth forecast from 2.1% to 1.7%. But they hope to turn the crisis into an opportunity. Restructuring British capitalism and reconfiguring the British state, making the system and its components fit for profiteering — that was the real rationale for this Budget. On Thursday 24 March the campaign Action for ESOL called a day of action against the cuts in funding for ESOL (English for speakers of other languages) courses. Government plans will see full fee remission restricted to students claiming “active benefits”. All students claiming “inactive” benefits, such as income support, disability allowance and housing benefit will have to pay up to £1200 a year for their English classes. Students on low incomes, spouses of low-wage workers or benefit claimants and refugees and asylum seekers will also be obliged to pay. UCU members in around 500 institutions took strike action last week as part of a series of parallel disputes over pensions and pay. For the fourth time in two years, cabin crew workers at British Airways have returned a huge majority for strike action on an enormous turnout. 83% of workers voted to strike, on a turnout of 72%. Their union, Unite, now has a month in which to declare action, which has elicited predictable bleating from the tabloid press about potential disruption to Easter holidays. As members of the National Union of Teachers and Unison in Tower Hamlets prepare to strike on Wednesday 30 March, NUT members in Camden will join them in a one-day strike as anti-cuts industrial action slowly begins to spread. The EDL blog “English Defence League Extra” has republished, with critical comments, a recent Solidarity article on David Cameron’s 5 February speech on multiculturalism. The EDL writer uses our article as a stick to beat the SWP. We have heard reports that a few SWP students have leapt on this as evidence of the AWL’s alleged political closeness to the EDL. This is just sad. They should read Trotsky’s response to Stalinist accusations that, because right-wingers cited his attacks against the Soviet bureaucracy, he must be in league with them.